IN continuation of our “green” theme, we feature, this week, two more developers offering properties that offer a “greener” environment. While some question the characteristics of a “green developer”, we put aside all precepts and judgments as to what constitutes the makings of a “green developer”, instead we highlight developments that offer lots of greens and adopt practices that care for Mother Nature. One such developer is Nilai Arif Sdn Bhd, a subsidiary of Hunza Properties Berhad, Hunza in short. Somewhat reflective of a new development by Nilai Arif, the name Hunza refers to the Karakoram Mountains of north Pakistan that borders with China called the Hunza Valley. Here people are said to enjoy an average lifespan of 120 years. It is also this area that is said to have inspired author James Hilton, who depicted the vision of Shangri-la in his novel called “Lost Horizon”. In view of this, we highlight Alila2, depicted as an alluring haven, “Where bliss is more than just a state of mind” states its brochure. 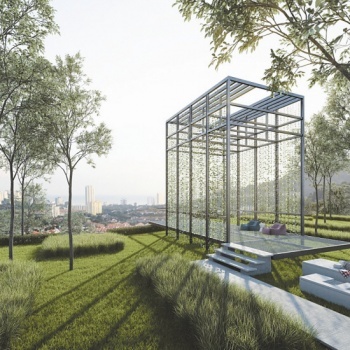 Somewhat “heavenly” claim some, Alila2 offers contemporary designed spaces to call home, built across wide and open areas that harmonise with the mountains and the sea in none other than the upscale neighbour of Tanjung Bungah in Penang. Promising breathtaking views and enchanting landscaped gardens alongside modern-inspired condominium units that come with a host of luxurious amenities and conveniences – location is another gem, where this development project is concerned. Offering low density living spaces of just five units per floor, there are more than eight various unit types to select from ranging between 1,905 sf and 5,789 sf. Spread across two towers on 9.8 acres of freehold land, Alila2 offers 270 housing units in total. Deemed “bungalows” or “semi-detached” homes in the sky, this development offers total privacy and comfort. Alila2 is not just located in an area that provides panoramic views of the hills and sea, it also stands in close proximity of TAR College and Tenby International School. This ideally puts a “tick” on the development, a criteria where “good DNA” is concerned in land matters. An excellent choice to make home of especially for families with school-going children and of course those who value time with these educational institutions located within the vicinity. Moreover, the development also ranks high for those who practice feng shui – with the verdant hill slopes overlooking the sea. Those who believe in the power of feng shui will recognize the symbolic presence of the “green dragon on the left and the white tiger on the right” – both prominent features that also appear “matured” and “strong”. In addition, the gentle hills behind the property are said to symbolise the “black turtle”, protector of the entire environment. Hitting high in green aspects, Alila2 regales as a place that offers modern resort lifestyles. Those who know how to appreciate the beauty of nature and the serenity of living by the sea will understand the beauty this gem of a development has to offer. Lush landscapes, some with trees and gardens, and some three acres of untouched hill land, bring forth days filled with awe and nature’s beauty. While refreshing sights and sounds are a daily occurrence, special landscaped features just add on to the value and worth of this amazing place. From the guardhouse leading to both towers is a path aligned with a canopy of forest trees. These provide a natural shade apart from a sight for sore eyes, additionally making way for a giant swing and cocoon seating that allow once to regale in Mother Nature’s arms. An infinity pool with Jacuzzi beds, seats and aqua gym equipment are available, against a waterfall backdrop supported by an aqueduct water feature. This sets the mood and sensation of being in a waterfall area in the forest. Tennis courts, a half court basketball court, relaxation pockets on timber decks and hammocks, places to lie down and kick off one’s shoes and just relax and take in the beauty of nature – there is an abundance of green features and nature-inspired activities specifically interwoven into this project development. Where nature is concerned, Alila2 is designed in compliance to the stringent standards of Malaysia’s Green Building Index (GBI) Certification. Both the condominium towers are designed using heat reduction methods and processes. These include shading devices, the use of glass in its design, plus reduced use of air conditioning, yet providing cool interiors. Timers and photo-sensitive switches help lower electricity consumption yet provide light when required, bearing in mind safety concerns. The two towers are also designed to meet the MS1525 requirements that uphold high indoor environment qualities for healthier living interiors. Smoking is also not permitted in public areas of the buildings while low VOC and environmentally-friendly materials are used throughout the project, improving indoor air quality. Build quality is also in line with the requirements of CIS7 and Qlassic standards, both that adopt environmental friendly proceedings. Site planning and management of the development is also planned to have low impact on the environment, with large land areas, not impacting environmentally sensitive areas. There is also no sediment discharge to local water ways, plus rain water tanks specially built to retain water. Materials and resources are all “eco-labelled” and environmentally-friendly, meeting GBI requirements where possible. Recycling is encouraged, with many opportunities that encourage residents to take up this good habit including a construction waste management plan. All water and sanitary fittings are also certified and use water sparingly and efficiently. Landscape watering is carried out using water stored from the rain water harvesting system. Moreover, the development also adopts an interesting fire protection system that uses an innovative method to recycle test water. All these reduce water consumption by more than 50%.